As a library administrator, you must define the inherited permission model for each document class. The inherited permission model defines how a document will inherit permissions automatically. - In Document Management libraries, document permissions are inherited from the document class by default. - In Secured Folders, document permissions of the default document class are inherited from folders. For any additional document classes you create, document permissions are inherited from the document class. 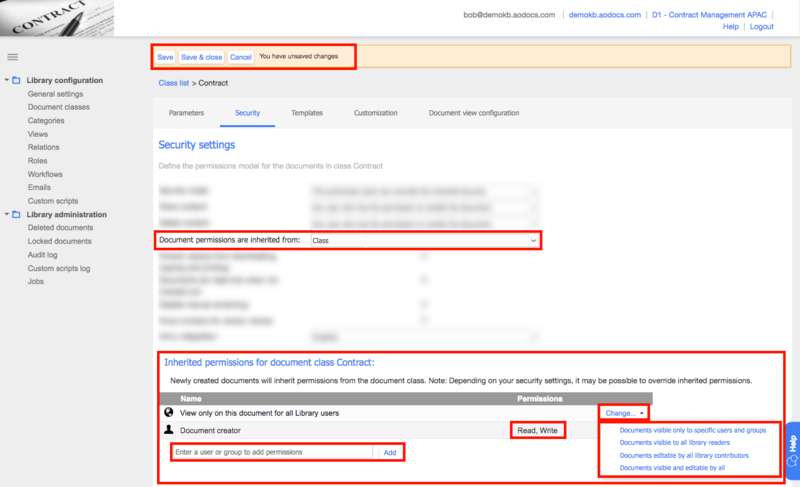 - In Team Folders, document permissions are inherited from folders. 3. Press the name of the document class you want to configure. Class: the permissions are the same for all documents in the class — these permissions are defined in the Security tab (see step 6). Folder: the permissions are defined by the document’s parent folder. Learn more: Share files and folders in your Secured Folder. The document’s current workflow state: the permissions are defined in the permissions pop-up for each workflow state. Learn more: Set workflow permissions. 6. If you set the document permissions to be inherited from the document class, the panel Inherited permissions for document class [class name] appears. If you select Document visible only to specific users or groups, you can add users and groups to the list of permissions: enter the user or group email and press Add. You can now restrict users from overriding the inherited permissions.